Early-stage founders spend a large portion of their time raising capital to fuel their startup’s continued growth. Receiving a term sheet from an investor represents a key milestone in the fundraising journey. First-time founders often scramble at the last minute to educate themselves on the concepts and terms found in a typical term sheet. There are many web resources that provide insight into the definitions of concepts captured in the term sheet. However, in addition to learning the mechanics of a term sheet, I strongly advise entrepreneurs to take a step back and consider the big picture of what each party wants from the investment. This is key to driving an effective and reasonable negotiation. I’m often surprised to find that very few advisors counsel their startup founders to understand what the incoming investor cares about. Failure to do so can unnecessarily complicate negotiations. I advise founders to apply a principle from my blog posting The Art of War on competing effectively: know your enemy. I do not suggest that founders take an adversarial stance with their incoming investors. I do encourage founders to put themselves into the investor’s shoes to know and understand what’s important to them. Once you understand the investor’s goals, you can formulate a positioning that addresses the investor’s issues while still maximizing your negotiating stance. Ownership structure: how much each party will own. Governance: who will be able to influence and control the key decisions of the company. Down-side protection: what happens if the startup doesn’t meet expectations. There are many other lessor considerations, but fundamentally, these three dominate the others. 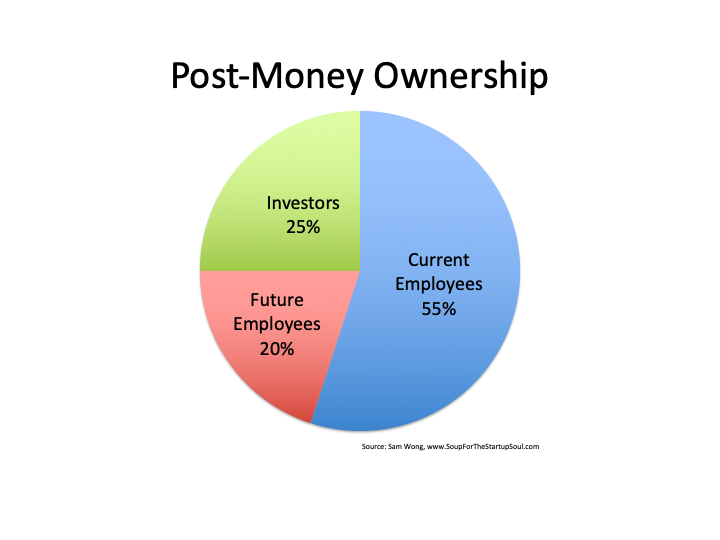 Ownership reigns as the most important consideration in the term sheet. Ownership share directly affects each party’s potential payout. Multiple factors affect the ownership, but the pre-money valuation and the size of the unallocated option pool often have the largest impact on each stakeholder’s final ownership share. 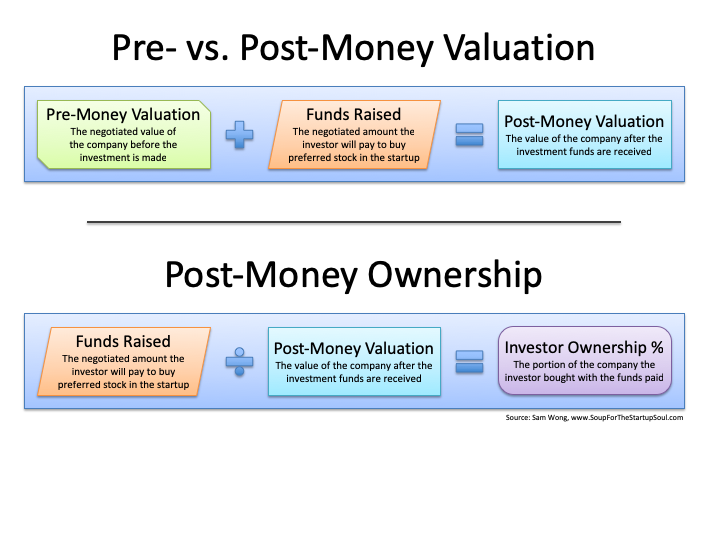 The pre-money valuation combined with the amount invested determines the post-money valuation. The amount invested and the post-money valuation determines the investor’s ownership share. The diagrams below illustrate this. The size of the unallocated stock option pool can sometimes surprise founders as a negotiating point. Most early-stage companies only have a fraction of the employees needed to grow and scale. Many investors expect the founders to carve out a large share of stock to allocate to future employees. Investors typically want a larger pool (25% or more) created while founders want a smaller pool (15% or less). The investors want to minimize the likelihood that the employees hired will exhaust the pool, so they ask the founders to create a larger pool before the funding closes. This dilutes the existing stockholders, but does not dilute the incoming investors, as the dilution happens before the investment closes. In contrast, the founders prefer a smaller pool to minimize their dilution. Additional stock can be issued to replenish the pool if it is exhausted in the future. The dilution from any stock issued in the future gets spread across a larger group of stockholders, resulting in less dilution for the founders. The point isn’t to get a perfect projection of how much stock will be allocated to employees the startup hasn’t even hired yet, but to position for possible future dilution. The pie chart below illustrates a representative ownership split after the investment closes — obviously, your specific situation may vary. 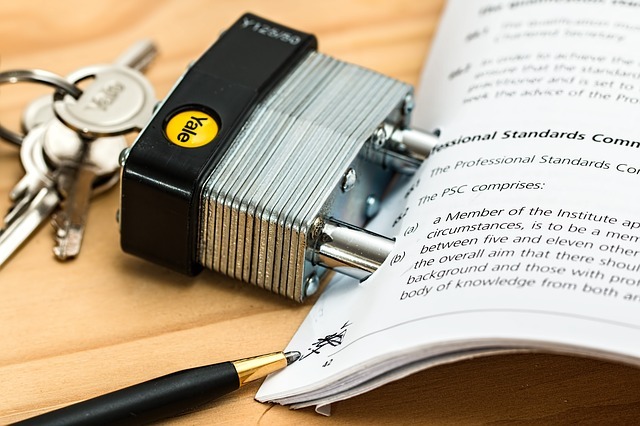 Investors also often negotiate for pre-emptive rights (the right to invest their pro-rata share in all future financing) to protect their ownership percentage as the startup grows. Many investors fight hard for this right so they can continue to invest in their best performing companies. In most cases, pro-rata share is reasonable. Founders should be wary of multiple pre-emption or “super pre-emption,” which grants the existing investors the right to invest more than their pro-rata share. Founders should also be wary of right of first refusal (ROFR), which allows existing investors to take the entire round at the negotiated terms. ROFR often scares away incoming investors, as they have little assurance that their due diligence on the potential investment will result in closing the financing, as the existing investor could exercise ROFR and take the deal away from them. If incoming investors are reluctant, founders then have fewer options for their next round of financing, resulting in the existing investors getting much more favorable terms (i.e., lower valuation) on the next round. Two common stockholders: typically, two employees/founders. Two preferred stockholders: typically, two investors. One neutral, outside party mutually agreed upon by the founders and investors. Creation of a senior security (typically, the next round of financing). Changes to preferred stockholder rights. Changes to the size of the board of directors. Entering into a contract above a certain size. Founders often negotiate to limit the number of protective provisions granted to preferred stockholders. However, some protection provisions are common. Very few investments are closed with no protective provisions granted to the preferred stockholders. Both the founders and investors contribute time, money, and effort because they expect the company to significantly grow in value. However, some companies grow slower than projected. Early dreams of 100x returns are dampened by the realities of an acquisition that is just two times the valuation of the most recent funding round. Double the previous valuation is still growth, but typically doesn’t provide a reasonable return in the high-risk game of venture capital. Investors often lobby for a liquidation preference with full participation (commonly referred to as a “double dip” for the investor as they have two different pathways to be paid upon an acquisition) in order to provide protection against an underwhelming acquisition price. If the founders enjoy strong leverage during the fundraising, they can negotiate for a liquidation preference with no participation. A reasonable middle ground can be a liquidation preference with a cap on the participation. In other scenarios, the startup may stumble, encounter circumstances beyond their control (e.g., geopolitical unrest, global economic weakness, etc. ), or fail to execute, resulting in the value of the company actually shrinking. In such cases, the startup may need to raise additional funds in a “down round” — where the next round’s valuation is lower than the previous round of fundraising. Or, none of these situations may happen – the company may decide to issue warrants or additional stock to address a specific business need. To protect against these dilution scenarios, investors negotiate for anti-dilution rights. Term sheets are full of complex concepts and legalese. It’s important to understand the legal constructs, but it’s more important to understand why they exist. When founders strive to think like an investor – when founders walk a mile in the investor’s shoes – you can understand what the investor wants and even anticipate what they will ask for. 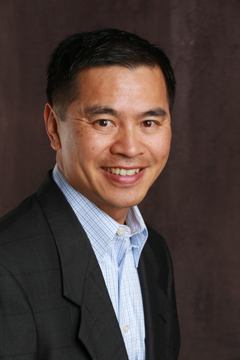 By knowing the investor and their goals, founders can: 1) explain why some concerns do not apply in your specific situation, 2) formulate responses that mitigate the concerns that do apply, and 3) propose more palatable alternatives that accomplish a similar outcome as the investor’s more aggressive request. With this understanding, founders become more effective at negotiating win-win agreements that both parties can feel good about.